See Eun Kim and recently appointed board member Yadira Martinez will run in May's board election. 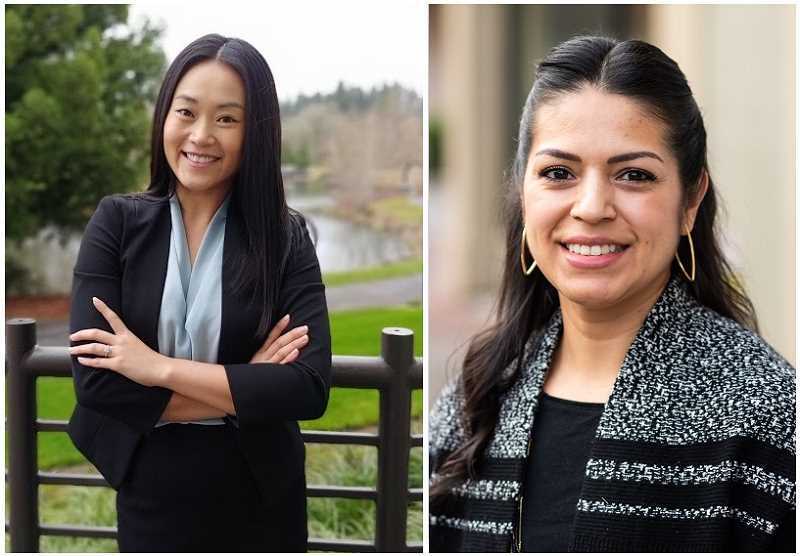 This year's Hillsboro School Board elections are still months away, but two local women have already thrown their hats into the race. Yadira Martinez, who was appointed to the board less than a year ago following the resignation of Wayne Clift, announced last week she intends to seek a full term on the school board. "I always knew that that was part of being appointed was that I was going to do this," Martinez told the Tribune last week. On Monday, Jan. 14, See Eun Kim, a former elementary school teacher, also announced her candidacy, running to fill the seat expected to be vacated by Kim Strelchun, who is not running for re-election after eight years on the board. Martinez' decision to continue representing the district boils down to her desire to be more involved and to fight for equity in education, she said. Martinez is one of two Latina members on the school board, representing a district where more than 36 percent identify as Latino. "For the students, being able to see that their leadership is made up of — and looks like — their student body, I think is super important," Martinez said. "When kids can't see somebody that looks like them up on these levels making decisions for them, they kind of feel left out and maybe not heard, so it's really important that students connect to who is representing them and making decisions for them. That's why I feel like the school board needs to be diverse — it has to have that representation of everyone at the table." Kim formerly worked as an elementary school teacher at the Academies of Math and Science in Phoenix, Ariz., where Kim said she experienced overcrowded classrooms and under-resourced schools. "She witnessed the wide array of social issues that impacted her students' ability to learn and was troubled by the minimal support available for teachers and families to find resolution," Kim's campaign wrote in a prepared statement. Kim has worked with several nonprofit groups over the years focusing on disaster preparedness and healthcare in war-torn counties. She led operations in more than a dozen counties for Medical Teams International, a Tigard nonprofit which provides medical care to disaster zones around the world. She currently volunteers at Tobias Elementary School, serves on the Citizen's Curriculum Advisory Committee and is a member of the Hillsboro Arts and Culture Council. Kim said she will work to ensure that all students are given equitable opportunities to reach their fullest potential. Kim said she wants to utilize her expertise "providing classroom instruction to provide a voice to children and address the disparities in schools." Martinez, likewise, said her professional experience will help on the school board. A dental hygienist at Virginia Garcia Memorial Health Center, Martinez said there is a direct correlation between health care and a student's ability to learn. Martinez also works one day each week at the district's school based health center at Century High School and serves on the Oregon Board of Dentistry. Martinez is a graduate of the Hillsboro School District. As a parent of three children, she said she has seen the challenges faced by students and families in the district. If elected, Martinez said she plans to focus on increasing funding for K-12 schools and grow the district's dual-language program, which she said has few resources to draw on. "The demand is higher than the supply," she said. "There are just not enough bilingual teachers." To combat that, Martinez said the district needs to focus on getting bilingual students interested in teaching as a career, so that they may return and teach in Hillsboro in the future. Martinez said she also plans to advocate for additional college and career pathway programs in the school district. For Kim, if elected, she plans to focus on improving equity among students, enriching parent partnerships and expanding wellness services, she said. "I hope to bring my unique perspective as an educator, child advocate, and dedicated community member to the decisions that ultimately impact the classroom and shape the future of our community," Kim said. "Our community is blessed with rich diversity, and I will advance policies to see that diversity, in all ways, is recognized as our greatest asset." Candidates can officially file for the seats in early February. Along with Martinez and Strelchun's seat, board Chairwoman Lisa Allen is also up for re-election.